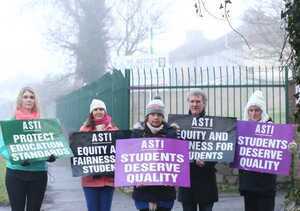 Almost 70% of second-level schools are closed today as the Association of Secondary School Teachers in Ireland (ASTI) engage in the second of a series of one-day strikes over the issue of equal pay for more recently qualified teachers. Posted in Misc and tagged ASTI, Strike, teachers at 2:52 pm on November 8, 2016 by Broadsheet. 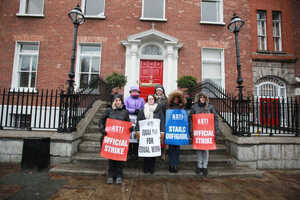 Equal pay strike today, Substitution and supervision lockout (strike) yesterday. 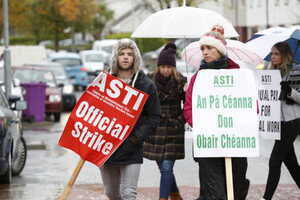 Will there be separate strike days against Croke Park hours and the new Junior Cycle. Hard to keep track of all the ASTI disputes. Still great to see them finally stand up to the unequal pay issue. How did they ever allow this situation to materialise? The Unions asked for it as a way of keeping their pay high. They could easily have taken a bigger cut at the time and never brought in the unequal pay situation. A point that isn’t really shouted about by ASTI. The extra money will have to come out of the departments’ current funding. So if they were to get a deal, it would mean less money for new teachers, schools, etc. I wonder how new graduates feel about colleagues with jobs blocking them from being hired? Typical answer, the current teachers, just an example, are and will not be blocking anyone from getting a job. The government refusing to have adequate resources are at fault. Why should the public sector, yes I work in it, be left on a salary that’s basically been cut below what it was 10 years. I’m honestly glad of my job/salary but it is less than my starting salary 10 years ago. Why? Because facts, that’s why. If the organisation can’t afford your wages then reality dictates one of two outcomes, either you lose your pay or you lose your job. Take your fupping pick and if you don’t like it then go do something else. Yes, I am one of the unfortunates who resides in the real world without the luxury of a permanent & pensionable same as you. I pay for my pension so that your point gone there. And yes it is permanent, simply because I could get paid more for what I do in the private sector. I choose stability over greed. But facts are facts my wages are still cut more than any other private sector. And don’t forget, they only get 20 weeks of holidays a year. Silly me. It’s only 19 weeks (52-33). I’m sure the private sector taxpayer feels better now. They were all FEMPI’d at the same time. 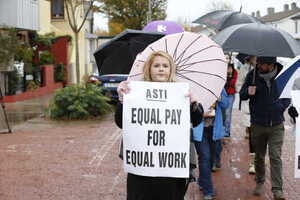 There should be an orderly restoration of pay across the board. Not really feeling that, DubLoony, to be honest: pay restoration sought by public sector unions will lead to a demand for more and more pay rises right as the economy is projected to stutter. Hard to argue with equal pay for equal work. Teachers have no performance targets that could be used as a measure. Teachers have no performance reviews that might indicate that the work is equal. There are essentially zero consequences for a teacher that consistently turns up on time and immediately switches off until it’s time to go home again. Also, was it not teachers themselves that voted for unequal pay for equal work? Obviously I am envious of their working hours / holidays / probable job for life type arrangement, but aside from that, I am curious about this. You are not quite correct on some your points Eoghan. evaluated by the Teaching Council. teacher performance to the principal. appraisal, which is overseen by the Teaching Council. the completion of the probationary period by the teacher. external support is also provided by the inspectorate as required. formal procedure whereby the quality of an individual teacher’s work is regularly evaluated. Nor is there any formal system for assessing the work of the principal. So once a teacher is fully qualified and in the job for a certain amount of time there is no regular assessment of performance, not as much as an every 5 years box ticking exercise. I wouldn’t normally be in favour of creating new levels of bureaucracy but, to me, something seems a bit off about that set up. Teacher’s Council is not fit for purpose. Inspections of schools are not carried out to documented standards and are left to the whim of individual inspectors. Service delivery in this sector is as fucked as it is in medicine, no accountability, no improvement or just culture. All power to the workers! This right wing government must understand that you cannot keep a people oppressed forever. Great stuff. I presume you won’t be paying for these pay rises. 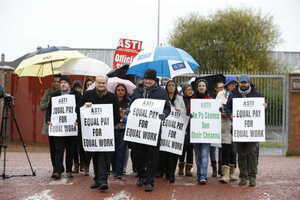 If they are so committed to equal pay why not lower their pay and meet the new entrants half way? ….seems fair? Are we or are we not currently under austerity measures? We’re told that we’re not, that the economy is making steady gains. That being the case there’s no reason why we shouldn’t be bringing to a halt these cost-saving attempts made during the austere period. If we can afford to pay our TDs a reasonable wage to shuffle papers around then we should be able to pay our teachers, nurses and guards. We as a country spend more than we take in every week…a lot more…. Any increases in pay for the public sector will be paid for by money we don’t have. However we will borrow more and more to meet these demands, to keep the unions and workers (all voters) happy…do you see where this is going? I think its high time for the government to stop collecting union subscriptions for the unions through payroll. The can send their members an invoice and collect them money themselves .